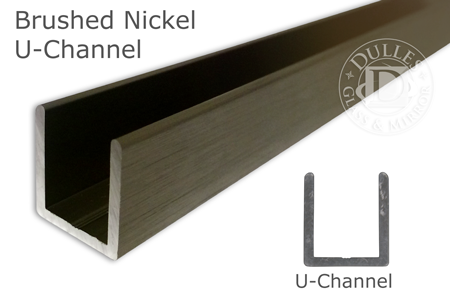 98" Brushed Nickel Deep U-Channel for 1/2" Thick Glass is a brushed nickel metal u-shaped channel for quick and easy shower door installations. Used for securing 1/2" thick glass to the wall, ceiling or floor. 3/4" deep U-channel can be used both at the top and bottom of the shower enclosure during installation. Deep U-channel pocket secures shower door glass panels firmly into place. U-channel gives your shower enclosure a clean, sleek look. Comes in an ample length of 98 Inches. Keeps the water inside your shower. Comes in Brushed Nickel (U-Channel also available in three other color options.) Mfg. by Troy Systems in the USA. Shipped by UPS. Perfect for do-it-yourselfers.